These thick, heavy-duty pads tackle tough cleaning jobs quickly and effectively. Boardwalk Scour Pads are ideal for cleaning food processing equipment and removing heavily baked-on foods. They also remove scuff marks from floors. These economical pads can be used in commercial or residential locations. 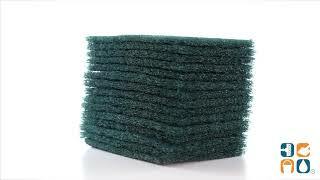 Order Boardwalk Heavy Duty Scouring Pads today and save. Buy more and save more! Size (W x L): 6" x 9"